Day 10 of our Advent Calender is going to show you another cute DIY present idea: a memory calender. The original genial idea for this project comes from Design Sponge. In contrast to a normal calender the purpose of a memory calender is not to plan future events but to archive and memorize beautiful moments in somebody's life. Start by stamping every date of the year onto your file cards (but without a year). In a next step put the (now stamped) file cards into your box. 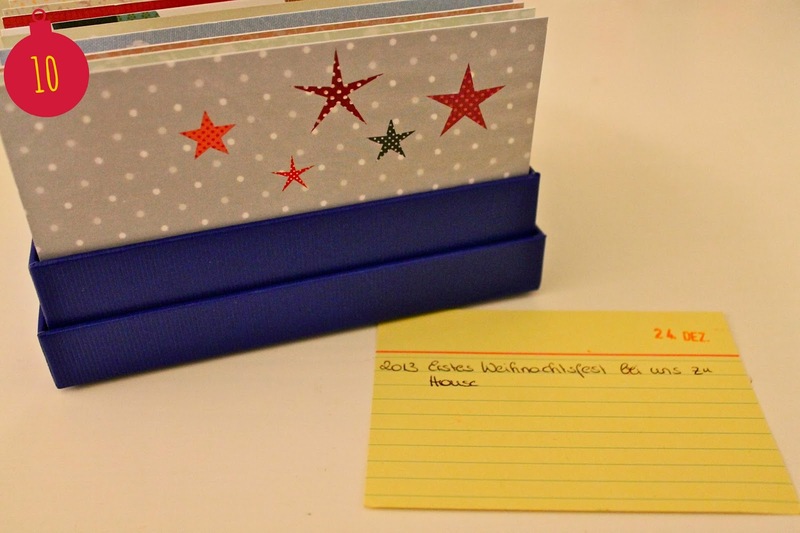 Cut the postcards into shape so that they are about one cm higher than your file cards and easily fit into the box (in my case 13,5 x 8,5 cm). They will separate the different months from each other. To start the memory calender pick the card with the current date and write down the current year plus what was the best thing that happened to you on that day. Over the time you'll get an archive about the happiest moments in your life. I hope you enjoy it!